Pizza egg melts make for a great breakfast or after school snack. 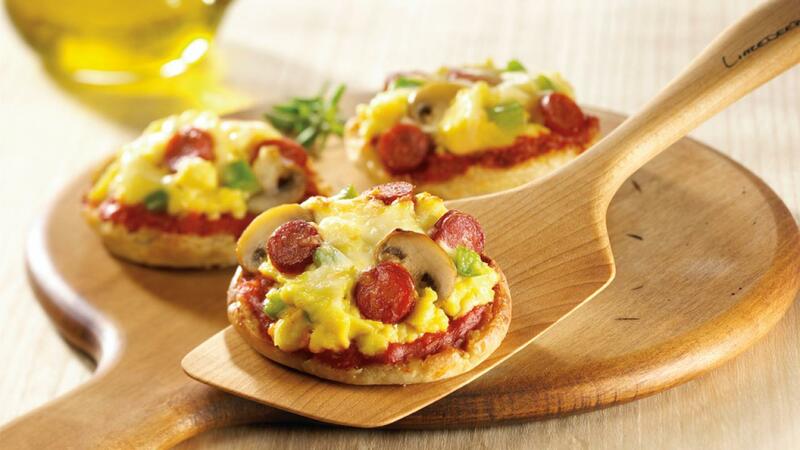 Ready in just 20 minutes, these mini egg pizzas baked on English muffin halves will quickly become popular with the whole family. Split English muffins in half. Place inside-up on baking sheet and toast in preheated 450°F (230°C) oven until lightly browned. Remove from oven. Spread each with pizza sauce; keep warm. Heat oil in non-stick skillet over medium heat. Add mushrooms and green pepper; cook, stirring frequently, until soft, about 2 minutes. Whisk eggs, milk and pepper in medium bowl. Pour into skillet with mushrooms and peppers. As mixture begins to set, gently move spatula across bottom and side of skillet to form large, soft curds. Cook until eggs are thickened and no visible liquid egg remains. Spoon eggs onto English muffins. Top with pepperoni and cheese. Return to oven; heat through until cheese melts and bubbles, about 2 minutes.